Donate to The Fund for a Responsible Guilford College! The Fund for a Responsible Guilford College is a project of the Guilfordians for Justice Coalition which is a coalition of community members that includes students, alumni, faculty, and staff concerned about Guilford’s history of profiting off of systemic racism and a collective interest in working towards a more just and truly transformative Guilford. We want to see a Guilford that is aligned with our core values and to set an example as an innovative leader in the fight against entrenched systems of oppression. By embracing the global call for divestment and reinvestment Guilford can model for the world what a mission-driven and justice-oriented institution of higher education looks like. We are rooted in our love for Guilford, the critical thinking skills it has reinforced within us and a strong belief that our liberation must leave no one behind. Our goal is to leverage the Fund for a Responsible Guilford College to help the Board of Trustees understand the problematic elements of our current endowment situation and the urgency with which we must move towards complete and total divestment from systems of oppression. Not only that but Guilford must model for the world what the beautiful solutions of the future can look like by reinvesting in models that bring about uncompromising justice. This fund is designed to ensure that if the school agrees to the stipulations of the fund, the energized alumni base and money raised will be used to reward the College for answering the call of justice. If Guilford College does not agree to the terms outlined below, the money raised will be used to fund the continuing work of student and community organizers in support of racial and economic justice. 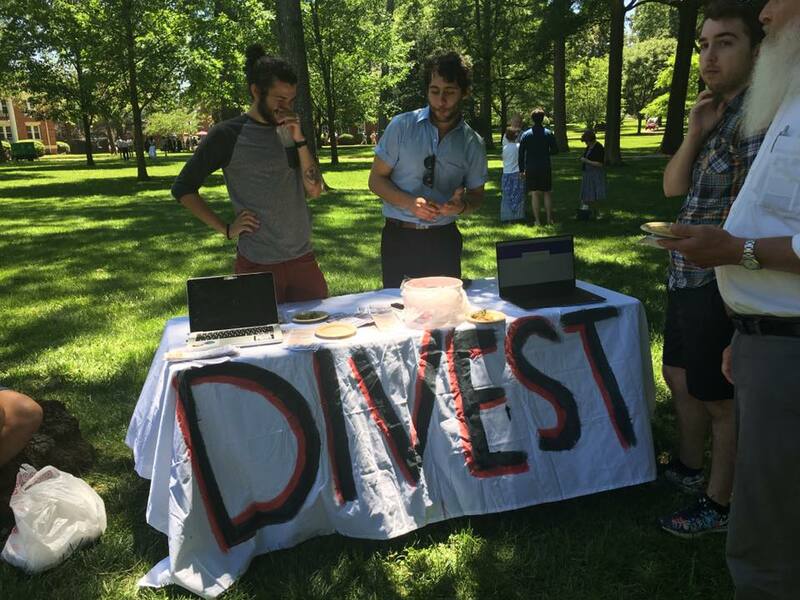 May 1, 2017: By this date, Guilford College must (1) provide the coalition’s Divest/Reinvest Committee with a written agreement expressing its commitment to divestment, thereby legally binding the institution to immediately freeze any current investments in fossil fuel companies*, the prison-industrial complex**, and the occupation of Palestine***; and (2) fully divest its endowment from these companies within five years of committing to divestment. In addition, (3) the Board of Trustees must have agreed to recognize and work with the coalition’s Divest/Reinvest Committee. This committee will, through a transparent and inclusive process, allow community members and campus stakeholders to be involved in decisions to reinvest at least five percent of the endowment in solutions rooted in racial and economic justice**** that confront the impacts of systemic oppression. If the College provides such an agreement by this date, the available balance on May 1st, 2017, will be donated to Guilford College’s endowment, and the fund will be terminated. If the College has not provided such an agreement by this date, 25 percent of the balance to date will be be administered in the form of fixed stipends for student organizers. These stipends will provide support to students working with on-campus campaigns and/or off-campus organizations doing social justice work, including, but not limited to: fighting for the rights of trans, queer, and undocumented people; organizing for racial and economic justice; and divestment/reinvestment organizing. Another 25 percent will be donated to Ignite NC to continue the important student organizing work being done across the state of North Carolina to combat injustice. May 1, 2018: By this date, Guilford College must provide documentation to the coalition Divest/Reinvest Committee that it has successfully committed to freeze any new investments in fossil fuel companies*, the prison-industrial complex**, and the occupation of Palestine***; to fully divest its endowment from these industries within five years; and to follow the recommendations of the coalition's Divest/Reinvest Committee. As mentioned above, the Divest/Reinvest Committee will, through a transparent process, allow students and campus stakeholders to be involved in decisions to reinvest at least 5% of the endowment in projects rooted in racial and economic justice that confront the impacts of systemic oppression****. If such evidence is provided, the available balance on May 1st, 2018 will be donated to Guilford College, and the fund will be terminated. If the College has not committed to the above stipulations, half of the remaining contents of the fund will be administered in the form of fixed stipends for student organizers. These stipends will provide support to students working with on-campus campaigns and/or off-campus organizations doing social justice work, including, but not limited to: fighting for the rights of trans, queer, and undocumented people; organizing for racial and economic justice; and divestment/reinvestment organizing. Another 25 percent will be donated to Ignite NC to continue the important student organizing work being done across the state of North Carolina to combat injustice. At this date, members of the Guilfordians for Justice Coalition, or its successor organization, will make an evaluation as to whether to continue organizing around the fund. Your tax-deductible donation will be made to the Fund for a Responsible Guilford College, a donor advised fund held at the Triskeles Foundation. Triskeles is a public charity in Pennsylvania. For more information about the Triskeles Foundation please visit triskeles.org. The Fund for a Responsible Guilford College is not affiliated with Guilford College. Have questions? Want to get involved? Who's donating: maurice nachlas from Baltimore, MD donated. Thank you! Just made a donation to Responsible Endowments Fund! If politics has taught me anything is that when being the change you want to see doesn't work well enough, the next step is throwing money behind it.